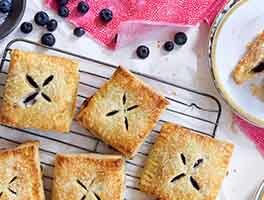 The "twist" to this blueberry pie is in both its filling (the berries are simmered in wine), and its flavorful whole wheat crust. The combination is a winner. To make the crust: In a medium-sized bowl, whisk together the flour, buttermilk powder, salt, sugar, and baking powder. Cut the butter into small cubes, and work it into the dry ingredients (using your fingers, a pastry blender or fork, or a mixer) until the dough is unevenly crumbly. Sprinkle in the ice water, mixing until the dough is cohesive. Grab a handful; if it holds together willingly, and doesn't seem at all dry or crumbly, you've added enough liquid. Divide the dough into two pieces, making one piece about twice the size of the other; the larger piece will be the bottom crust. Shape each piece of dough into a disk about 1" thick. Working with one disk at a time, roll the edges along a floured work surface (as though the disk were a wheel), in order to smooth them out. Wrap them in plastic wrap, and refrigerate overnight, or for up to 3 days. To prepare the blueberries: Place the berries in a large sauté pan. Add the wine. Simmer the berries gently, over medium-low heat, until the liquid in the bottom of the pan is syrupy; this will take about 45 minutes. Remove from the heat. 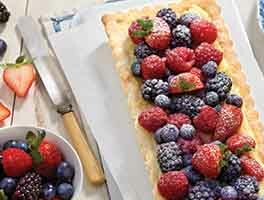 This step can be done the day before; refrigerate the berries overnight. To roll the crust: Flour your work surface, and roll the larger piece of dough into a 12" circle. Transfer the dough to a 9" regular (not deep-dish) pie pan that's at least 1 1/4" deep; leave the edge hanging over the edge of the pan. To prepare the filling: In a medium-sized bowl, stir together the blueberries and their juice, the spices, vanilla, sugars, salt, and lemon juice. Mix in the butter, then the flour. To assemble and bake the pie: Spoon the filling into the crust. Roll the remaining piece of dough into a 9" circle, and lay it atop the filling. 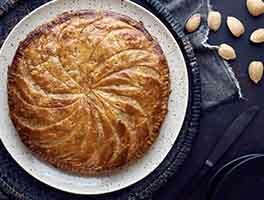 Bring the hanging edges of the bottom crust up and over the top crust, rolling and squeezing them together, then crimping decoratively. Cut three slashes in the top of the pie, to allow steam to escape. Brush the top crust with milk and sprinkle with sparkling sugar, if desired. Bake the pie for 30 minutes. Lay a sheet of aluminum foil gently on top, covering the entire crust. Bake for an additional to 30 to 40 minutes, until the crust is golden brown and you can see the berries bubbling through the slits in the crust. Remove the pie from the oven, and cool for 2 hours before cutting. Store in the refrigerator for up to 5 days. We discovered that simmering the blueberries in wine before using them enhances their flavor; they don't taste like wine, just more like themselves. We always use frozen blueberries for pie, considering the price and seasonal availability of fresh. We find simmering the frozen berries in wine before using them allows them to thaw and release some of their liquid; the liquid then evaporates as the berries gently simmer. This prevents the finished pie from being watery, in addition to giving it great flavor. 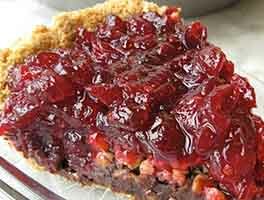 The crust here is made with whole wheat pastry flour, which results in a darker, less traditional crust; but its color harmonizes nicely with the dark purple-blue of the berry filling. If you're not keen about whole wheat pie crust, substitute your own favorite crust, or our Classic Double Pie Crust. 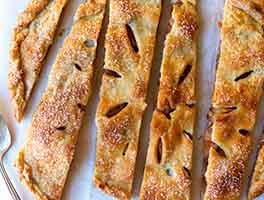 Need some tips about how to roll out a pie crust? Please read our Complete Guide to Perfect Pie Crust, and our Complete Guide to Pie Baking. Enjoyed this pie. A few of my notes: I barely had enough dough for this pie. Followed the recipe to a T, so not sure what happened there. In the future I will double the dough. Loved being able to use whole wheat pastry flour and my crust was flaky. Although i enjoyed the flavor of the pie, it reminded me more of a 'winter' pie, than a fresh summer pie, which was more what I was looking for (It's July and was 100 degrees today). The spices added to that winter flavor in my mind. I would make this again for the holidays. Loved simmering the blueberries in blueberry wine and that flavor definitely came through. The recipe is spectacular; I've made it several times. I had to change it up once because I was in a hurry. Here is my hurry-up version: Prepare the pie crust and roll it out, placing the bottom crust in a 10' glass pie pan. Set this aside, unbaked until the filling has been poured in and the top crust has been added and sprinkled with sugar. Begin preheating the oven to 400-F. Prepare the filling. In an x-lg mixing bowl, stir well: 1/8 tsp cinnamon 1/16 tsp allspice 1/4 c brown sugar a tiny pinch of salt. Toss in: 2 - 4 c fresh blueberries (or frozen unthawed berries can work) 20 oz can of blueberry pie filling 2 TBS juice frozen concentrate undiluted (apple cherry works) 1 TBS fruity wine 2 TBS lemon juice 1 tsp vanilla Stir with an over-sized serving spoon about seven times. Place the blueberry filling mixture in the prepared unbaked crust. Top with top crust. Sprinkle w/coarse sugar. Bake at 400-F for 40 minutes and then shut off the oven, not opening the door for an additional 20 minutes. Fantastic recipe. My husband said it reminded him a little of mulled wine. I used the whole wheat pie crust recipe from the back of the King Arthur Whole Wheat Pastry Flour bag, used half frozen blueberries, and half frozen cherries because that's what I had on hand, and used about 3 Tbsp + 1 tsp Instant Clearjel instead of flour to set the pie. Outstanding. So good! I made this for my friends son who was going away to college. He ate 1/2 the pie in one sitting. He requested another one for his Birthday in December. Looking forward to making this pie again. I made this pie today in my Grandmothers pie crust. The taste was great but the filling was very loose and soupy. How would you get the filling to gel up and be more solid? 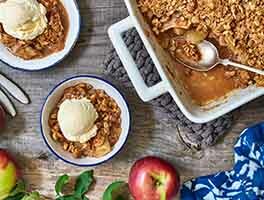 Stunning recipe! I used this filling with my husband's home-grown fresh blueberries and the all butter pie pastry. The only change I would make is that I would back the allspice down to 1/8 tsp as I thought it was a bit strong. The simmering in wine really made quite the difference - I was able to find a blueberry wine so. I have't had a chance to bake this (yet) but for the crust, rather than buttermilk powder could you just substitute cold buttermilk for the water? Seems logical, but the chemistry may not work. GREAT recipe! Friends are always asking me to make it. I do use store bought crust and still fabulous. I omit wine -- add orange and zest, orange juice. Use real vanilla bean and cinnamon sticks too. I'm always amazed how much of this pie people can eat in one sitting! This is my first time making a fruit pie all by myself, and it was fantastic! I used the no-roll pie crust instead of the one included, and everything turned out great. I definitely recommend this recipe as an easy one to get started with. Outstanding blueberry pie. I added a touch more bberry wine and added half a teaspoon of corn starch. Ditch the all spice and add a dash of ground cloves.